This creamy chili recipe is filled with beans, tomatoes, and pumpkin which blends in deliciously. It’s a filling meatless meal that cooks all day and is ready for dinner whenever you are! I’m proud to be partnering with Produce for Kids to bring you this delicious soup recipe! I live in a neighborhood nestled on a hillside. While it’s a small hill, it has enough elevation to have some beautiful views, especially in the fall. The color of the trees turning, the crisp cool air, and traditional fall foods make it my favorite time of year. Fall recipe ideas are endless, and it seems the star of fall recipes is that beautiful orange squash, the pumpkin. Pumpkin is an extremely versatile ingredient that can be added to boost the nutritional value of many recipes. 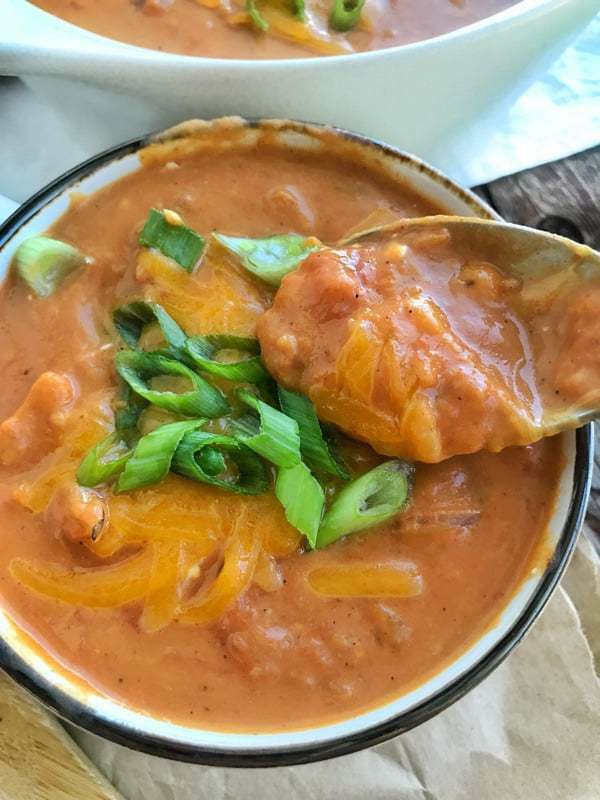 While I love making pumpkin bread and muffins, an unexpected way to use pumpkin is in soup, like this slow cooker Pumpkin Chili. When it comes to the nutritional breakdown, pumpkin packs a huge fiber punch. Just one serving provides 20% of the daily value for fiber. Pumpkin is rich in vitamin A, which helps support healthy vision, proper cell growth, and a strong immune system. The vibrant color of pumpkin comes from the carotenoid, beta-carotene. Dietitian Tip: Beta-carotene has been the focus of much health research, with current evidence suggesting it may help protect against cancer and help fight inflammation. Heat olive oil in medium-sized sauté pan. Sauté onions and peppers until translucent, about 4 minutes. Add sautéed onions and peppers to crockpot. To crockpot add all ingredients except the cream cheese. Cook 2-3 hours on high, or 7-8 hours on low. Before serving, stir in cream cheese until melted. Add the sauteed onions and peppers, canned diced tomatoes, canned beans, and canned pumpkin to your slow cooker. Kitchen Tip: You can skip sauteeing the onions and peppers, but the extra flavor boost you get from the caramelized flavors of sauteeing is worth the extra step! Add the chicken broth, maple syrup, and spices then stir. Kitchen Tip: You can swap veggie broth for chicken broth to make this a vegetarian soup. No maple syrup? Use brown sugar instead! After the slow cooker pumpkin chili is done cooking, add softened cream cheese and stir in well. This adds the creaminess to the soup that makes it oh so delicious! 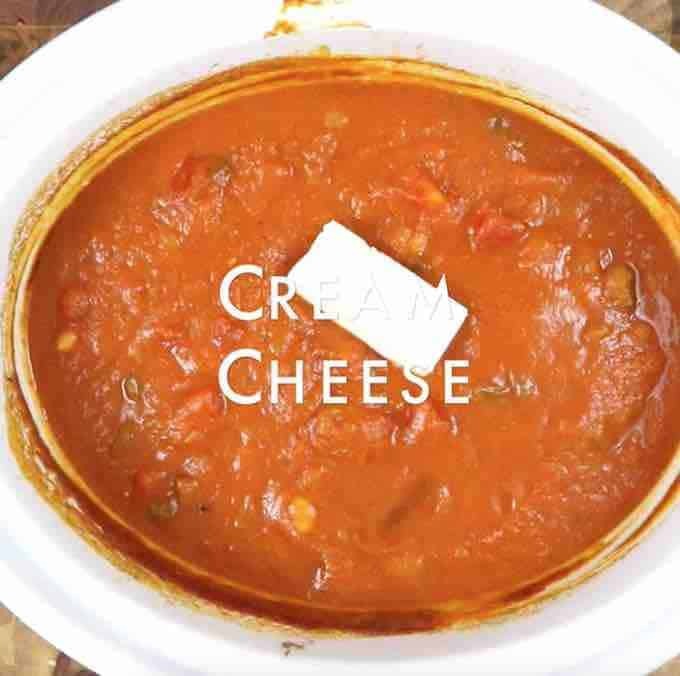 My children couldn’t stop talking about how good this creamy chili was, I hope your family enjoys it just as much! Looking for more unique ways to use pumpkin this fall?! Check out these 11 Creative Ways to Use Pumpkin Puree. Watch step by step how to make the recipe in the video above! This Crockpot Pumpkin Chili Soup is the perfect fall recipe idea. Pumpkin blends into this chili recipe seamlessly boosting nutrition, and adding a delicious creaminess to the slow cooker soup. Cream cheese is added at the end of cooking for the perfect finishing touch. Heat olive oil in medium sized sauté pan. Sauté onions and peppers until translucent, about 4 minutes. Garnish with shredded cheese, green onions, or sour cream. Love your crockpot as much as I do? Check out tons of Crockpot Dinner Ideas HERE! 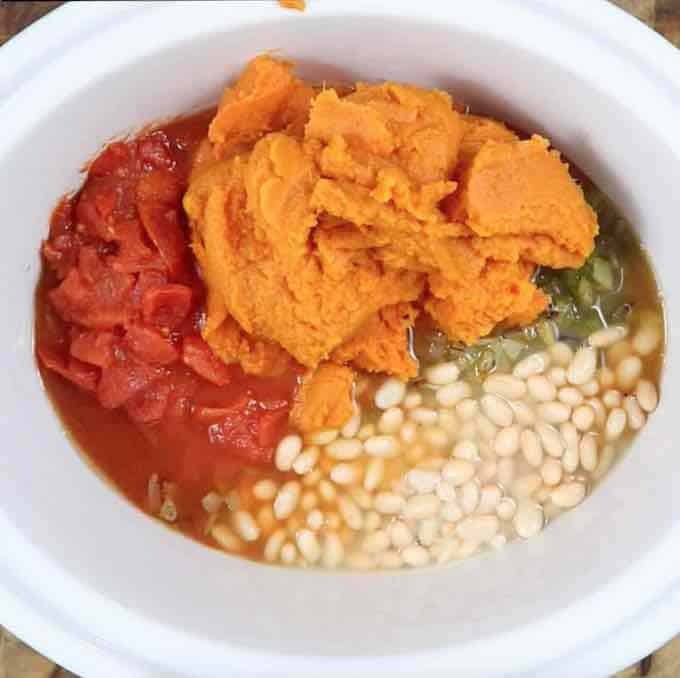 In this recipe, are the beans put into the crock pot dried or cooked? 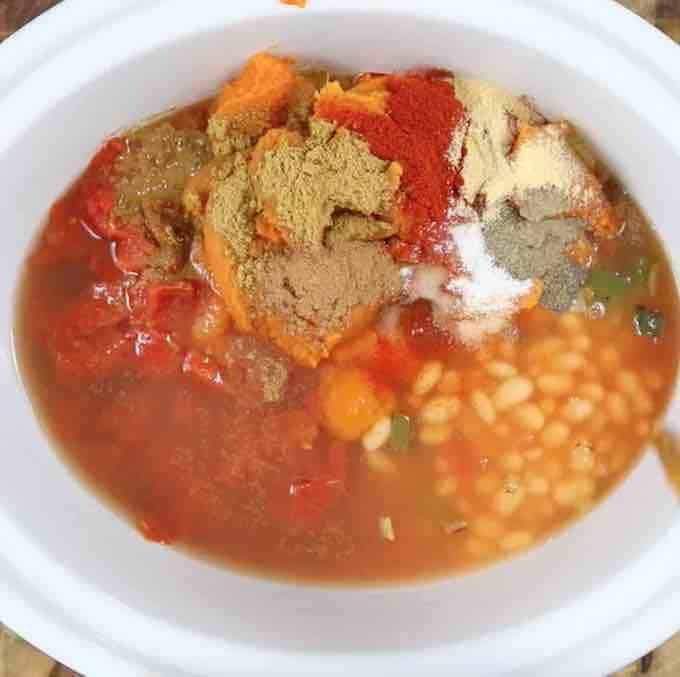 Hi Elizabeth – I used canned beans in this recipe to make it super easy! I hope you enjoy! I’ve made this several times and I am always surprised by how delicious this is – you can’t even tell there is pumpkin puree in the chili. It just gives it a creamy texture and nice flavor.